Pavel Gojdic (pronunciation Goydich) was born on July 17th, 1888 at Ruske Peklany near Presov, into the family of the Greek Catholic (Byzantine Catholic) priest Stefan Gojdic; his mother's name was Anna Gerberyova. He received the name of Peter in baptism. He attended the elementary school at Cigelka, Bardejov and Presov, finishing his primary studies at Presov, which he concluded with his maturity exam in 1907. Obeying God's call to the priesthood he began his study of theology at Presov. Since he obtained excellent results, he was sent a year later to continue his studies in Budapest. Here too he tried to lead a profound spiritual life. While still a seminarian he was directed by his spiritual director on these lines: "Life is not difficult, but it is a serious matter" – words that were to guide him throughout his life. Having finished his studies on August 27th 1911 he was ordained priest at Presov by Bishop Dr. Jan Valyi. After his ordination he worked for a short period as assistant parish priest with his father. After a year he was appointed prefect of the eparchial seminary and at the same time taught religion in a higher secondary school. Later he was put in charge of protocol and the archives in the eparchial curia. He was also entrusted with the spiritual care of the faithful in Sabinov as assistant parish priest. In 1919 he became director of the episcopal office. To everyone's surprise on July 20th, 1922 he joined the Order of St. Basil the Great at Chernechia Hora (Monks' Mount) near Mukacevo, where, taking the habit on 27.1.1923 he took the name Pavel. He took this decision as a sign of modesty, humility, and a desire to lead an ascetic life in order to better serve God. But God willed otherwise and had ordered him to a higher office as bishop. On September 14th, 1926 he was nominated Apostolic Administrator of the eparchy of Presov. During his installation as Apostolic Administrator he announced the programme of his apostolate: "With the help of God I want to be a father to orphans, a support for the poor and consoler to the afflicted". The first official act of Pavel Gojdic in his office as newly appointed administrator of the eparchy of Presov was to address a pastoral letter on the occasion of the 1100 anniversary of the birth of St. Cyril, Apostle of the Slavs. Thus he begins his activity in the spirit of the Apostle of the Slavs, always faithful to Rome, as they were. He was a Slav and was very fond of his byzantine rite. A short time later, on March 7th, 1927 he was nominated bishop with the title of Harpas (Church of Harpas - in Asia Minor). The episcopal consecration took place in the basilica of San Clemente, Rome, on March 25th, 1927, the feast of the Annunciation of Our Lady. After his episcopal ordination he visited the Basilica of St. Peter in Rome, where he prayed on the tomb of the Apostle. On March 29th 1927, together with Bishop Nyaradi, he was received in a private audience by the Pope Pius XI. The pope gave Bishop Pavel a gold cross saying: "This cross is only a faint symbol of the heavy crosses that God will send you, my son, in your work as bishop". For his episcopal programme he chose as a motto the following words: "God is love, let us love Him!". As bishop he was engaged in the promotion of spiritual life of both clergy and faithful. He insisted on the proper celebration of the liturgy and of church feasts. Following new conditions he erected new parishes, for instance, in Prague, Bratislava, Levoca and elsewhere. Thanks to his hard work the orphanage at Presov was built, and entrusted to the order of the Servants of the Immaculate Conception of the Virgin Mary. His activity in the scholastic field was outstanding, as is proved by the foundation of the Greek Catholic school in Presov in the year 1936. He supported also the teaching academy, the seminary, colleges etc. He was interested in every aspect of spiritual reading, which resulted in the launching of the review Blahovistnik (Messenger of the Gospel), Da prijdet carstvije Tvoje (Thy Kingdom Come) and various prayers etc., published by the PETRA publishing house. For his kindness, caring and charitable relationship with the people he was described as "a man with a heart of gold". An important characteristic of the bishop was also his strong affection for the Eucharistic Saviour, which he continually strengthened through his visits to the Eucharist in the chapel at his residence. Another characteristic, not less evident, of his spiritual life, was his devotion to the Sacred Heart. Already as a seminarian in Budapest he had consecrated himself to the Sacred Heart and this he confirmed every morninng with the words "All the prayers, sacrifices and crosses I offer to make up for the sins of the whole world!". One must not forget that the bishop had great devotion to the Mother of God and as a marian devotee held in his residential chapel an icon of the Virgin of Klokocov, in front of which he prayed every day and to whose protection he entrusted himself and the whole eparchy. On April 13, 1939 he was appointed Apostolic Administrator in Slovakia of the Apostolic Administration of Mukacevo (south-eastern part of Slovakia). 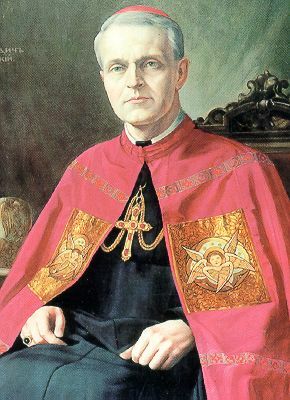 In the difficult situation of the Slovak State (during World War II) he became a "thorn in the flesh" for the representatives of the government of the time and so offered his resignation from the post – in fact the present Pope appreciated his work and not only refused his resignation but also made him residential bishop of Presov. And so on August 8th, 1940 he was solemnly enthroned at Presov and then on January 15, 1946 confirmed in his jurisdiction over the Greek Catholics in the whole of Czecho-Slovakia. The progress in religious and spiritual life in the eparchy that followed the personal example and fervour of Bishop Pavel was interrupted by the events of war, and especially with the coming to power of the communistcs in 1948. Their ideological programme made itself felt above all against the Greek Catholic Church. Bishop P. P. Gojdic resisted any initiative to submit the Greek Catholics to Russian orthodoxy assisted by the communist party and the power of the State, even though he knew he was risking persecution and arrest; maybe even death. Gradually he was isolated from the clergy and the faithful. Even though put under severe pressure to renounce the Catholic faith and break unity with the Pope, he refused every attractive offer and exclaimed: "I am already 62 and sacrifice all my goods and residence, but I will not deny my faith in any way because I want to save my soul. Do not even come to me". During the events sadly known as Sobor of Presov, April 28, 1950, when the State outlawed the Greek Catholic Church and forbade her activity, Bishop Pavel Gojdic was arrested and interned. Thus began his via crucis in many prisons of what was Czecho-Slovakia, which ended with his death. In the days from the 11 to the 15 of January 1951 in a trial set up against the so called high treason bishops (Vojtassak, Buzalka, and Gojdic) he was given a life sentence; fined two hundred thousand crowns and deprived of all his civic rights. Transfers from one prison to another followed. Bishop P. P. Gojdic suffered physical and psychological punishments, humiliations, was forced to do the most difficult and degrading jobs. However he never complained and never asked to be relieved. He made use of every available time to pray, and celebrated the sacred liturgy in secret. Following the amnesty in 1953, given by State President A. Zapotocky, his life sentence was changed to 25 years detention. He was then 66 and his state of health deteriorated continuosly. Yet all further requests for amnesty were refused. Bishop Pavel Gojdic could only leave prison at the cost of his faithfulness to the Church and to the Pope. Various offers were made to him, as is proved by an events that he himself recounts: In the prison of Ruzyn he was received in an office, where he had been brought from his cell, by a high official in uniform who informed him that from that office he would go straight to Presov, on condition that he was willing to become Patriarch of the Orthodox church in Czecho-Slovakia. The bishop refused this offer excusing himself and explaining that this would be a very grave sin against God, a betrayal of the Pope, of his conscience and of his faithful, most of whom were then suffering persecution. Even in the most difficult situations he abandoned himself to the will of God, as can be seen from these words of his: "I do not really know whether it is a gain to exchange the crown of martrydom with two or three years of life in freedom. But I leave the good Lord to decide". On the occasion of his 70 birthday even the Pope Pius XII sent him a telegram in prison. In it he assured him he would not forget his heroic son. For the bishop this was one of his best days in prison. A great desire of bishop Gojdic was to die comforted by the sacraments on his birthday. Both desires were fulfilled. Father Alojz Vrana was transferred to the room of the prison hospital of Leopoldov, where the bishop passed his last days, and could hear his confession. The chalice of suffering of Bishop Pavel was about to overflow. An eye witness of the last instants of his life was his fellow prisoner – the nurse Frantisek Ondruska, who has given a unique testimony. He confirmed that the desire of the bishop had been fulfilled – he died on July 17th, 1960 that is on the day of his 72nd birthday. He died in the hospital of the Prison of Leopoldov as a result of illness resulting from the ill treatment he had suffered. Afterwards he was buried without ceremony in the prison cemetery in a nameless tomb, with the prison number 681. As a result of the easing of the political situation in Czecho-Slovakia in 1968, the state autorities after many delays gave permission for exhuming the mortal remains of Bishop Pavel Gojdic. This happened in the cemetery of Leopoldov on October 29th, 1968 and was followed by the transfer of the remains to Presov. By a decision of the authorities set up after the Soviet occupation these were transferred to the crypt of Greek Catholic Cathedral of St. John the Baptist in Presov. From May 15th, 1990 they are to be found in a sarcophagus in the chapel of the cathedral. Bishop Pavel Gojdic was legally rehabilitated on September 27th, 1990. Subsequently he was decorated posthumously with the Order of T. G. Masaryk – 2nd class, and with the Cross of Pribina – 1st class. The Pope John Paul II during his historic visit in Slovakia, while visiting Presov, prayed at the tomb of this bishop-martyr in the chapel of the cathedral. Saint bishop and martyr Pavel, pray for us sinners. Another biography of our bishop and martyr Pavel Gojdic, OSBM.